So many models to mention - we still have more to add so keep coming back to see what's new. The diversity of models and changes within Hillman, Commer and Karrier was vast. I hope that others will add to the history in this section. I'll make a start in the 1950's part way through the history of such a varied range of vehicles, - Pictured below is my 58' model Series III Minx. In the mid-1950's Rootes decided to release a new version of the Minx to follow the popular and successful Mark Minx. It was to have the same 1390cc engine as the current Mark VIII, with minor improvements, but updated steering and suspension, and a completely restyled body, the object being to create more space for the passengers inside. During development this new body style was known as 'Audax' - latin for 'bold' - and the new design, a radical departure from the Mark VIII, was certainly striking. The designer, Raymond Loewy, had previously worked not only for Rootes, but also for Studebaker, amongst others, having been responsible for the 1949 Starlight Coupe. Two-tone paint schemes, often associated with the Minx, were not new to Rootes. The Californian and the 'Gay-look' Mark VIII had them, although other manufacturers offered them only on top-of-the-range models, such as the Ford Zodiac and the Vauxhall Cresta. In fact, the Minx was not the first of the Rootes cars to use the Audax design. That honour went to the more upmarket Sunbeam Rapier, first unveiled at the 1955 Motor Show. 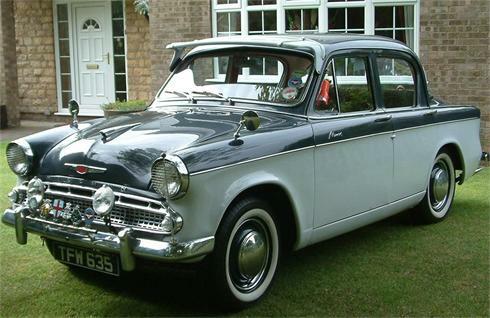 The Series I Minx, as it was designated, was launched in May 1956, a little before the similarly-styled Singer Gazelle, announced in September '56. The 'De Luxe' was the 'standard' version of the car, while the 'Special' was a low-cost version with simpler body and interior trim. The low price was set to attract the attention of fleet buyers. For a more sporty version of the convertible, a twin-carburettor conversion by Alexander Engineering of Haddenham, Bucks was available. It used the same 1390cc engine, but, in addition to the two SU semi-downdraught carburettors’, performance was enhanced by raising the compression ratio to 8.6:1 (compared to 8:1 on the standard production model), by polishing the combustion spaces, and by enlarging and polishing the inlet ports. A Laycock-de Normanville electrically-operated overdrive was fitted to top and third gears. Otherwise, the Alexander conversion was similar to the standard convertible. The battery had to be moved to the boot to make way for the carburettors, but this was felt to aid weight distribution. Externally, the very smart paintwork included a wide side-flash, not dissimilar to the Singer Gazelle or Sunbeam Rapier, and a small badge appeared on the wings immediately in front of the doors. "The results of the conversion on the car as a whole are impressive, and there are no really undesirable side-effects to mar the added performance. The acceleration data are quite remarkable. Here are a few examples, with the times of the standard saloon given in parentheses: 0 - 60mph, 18.9sec (27.7); 0 - 70mph, 28.1sec (46.1); standing quarter mile, 21.6sec (23.5). All these figures were obtained without using the overdrive, as the extra ratios come into their own primarily when cruising on the open road." The cost of the conversion was £172 13s, making the overall price £1071. Hillman had been in existence for about 50 years at this time, and the first Hillman Minx had appeared 25 years before, in the 1931/32 season, so when Rootes introduced changes to the Series I in August 1957, cars in the new range were named the 'Jubilee' models. Outwardly, the Series II could be distinguished by a new style of radiator grille, raised bonnet badge, and chrome surrounds on the front and rear windscreens. The bumpers were set a little further out from the body. Changes elsewhere were restricted to minor modifications to the engine and steering gear. Prices for the De Luxe and Convertible rose slightly (£21 and £50, respectively, including tax), but the Estate and the Special remained the same. An interesting new feature of the Series II Minx was the 'Manumatic' system semi-automatic transmission option. This was not the fully automatic system used on later Series Minxes, as the standard 4-speed gearbox was used, and the clutch operated by pressing on the end of the gear stick. The system was not exclusive to Rootes, and other manufacturers such as BMC also used it. A variation on the Series II was made by the Japanese, under the Isuzu name. Shortly afterwards came the unique and lovely Series I Husky - half-saloon, half-estate car, resembling the Series II Minx from the front, but with a glazed, van-like rear. The bumpers were different and the trim simpler, in the manner of the Minx special. The Husky was able to carry four people, when required, but the rear seats folded forward and, with a side-hinged rear door, a large storage space was accessed - the forerunner of the ubiquitous modern hatchback, in fact! In fact, the price of the Husky at this time was only £698.17s - including tax - making it £50 cheaper than the Special and £240 cheaper then the larger Estate! "Add 7 1/2% more engine size to an extremely popular model, raise the compression ratio slightly for a further increase in medium-speed torque, and then re-gear the final drive to reduce the engine revolutions per mile by 5%: that, in brief, is the Rootes recipe for a 1959-model Hillman Minx such as we have been able to savour on English and Welsh roads, and whilst the result is not meant to be sensational we found it very well to our taste. So said The Motor , October 1st, 1958. There were several changes to the Minx in 1959. Chiefly, it was given a new, larger engine - 1494cc - revised gear and axle ratios, new clutch and steering mechanisms and a revised exhaust system. Some alterations were made to the bodywork: a new, wider grille was fitted with the word HILLMAN on the surround above it, and the Hillman 'wings' motif on the front of the bonnet. Headlamp rims were chrome-plated. The rear of the car also had a slightly different look. Although the shape of the boot and wings remained the same, the position of the boot handle and number plate light were lowered and the format of the number plate itself changed to a rectangle, like the front plate, rather than a square. The division between the two colours in the two-tone versions was lowered from the line just under the side windows to the trim-line along the doors, and raised to the same level from the bottom edge of the boot lid to the handle. Inside, the fascia was redesigned to include all the gauges and controls in one panel, including the radio (now standard on the convertible) and (optional) heater. Provision was made for an ammeter, oil-pressure gauge and clock, although these three were available as optional extras. Despite these improvements, prices remained the same - indeed, the cost of the estate fell from £625 (£938.17s, including tax) to £598 (£898.7s, including tax) - the same as the convertible. Other items listed as extras at this time included: cold air ventilator, locking fuel cap, second sun visor, towing bar, exhaust tailpipe extension, wheel rim finishers, wheel discs, second horn, badge bar, starting handle, tool-kit, normal or long-range fog-lamp, whitewall tyres and accelerator pedal rubber. This model was designated the Series III. In 1959 further significant changes were made to the Minx. It was numbered not Series IV, but Series IIIA. Again, there was a change to the grille, which was now wider and more elaborate, incorporating rectangular rather than round side lamps, and the Hillman wings. The HILLMAN letters appeared on the front of the bonnet. The headlamp rims were not chromed, but painted body colour. At the rear of the car, large, curved wings were added to all models, except the estate, together with large, elliptical tail lamps. The floor-mounted gear lever became the standard and the column change an option, and automatic transmission, available on saloons, convertibles and estates, now used Smith's fully automatic Easidrive in place of the semi-automatic 'Manumatic' system which had been used before. This new system employed a flywheel/clutch operated by a magnetised powder, and the Minx became the first automatic in its class. Again, despite the many improvements, the price of the Minx De Luxe saloon was reduced to £764 14s 2d, including tax; the Special was £722 4s 2d; the convertible £872 7s 6d, and the estate £858 4s 2d. The Series IIIA was available in 6 single colour finishes and 6 two-tone, but the two-tone was £14 3s 4d extra, and the 'Easidrive' automatic transmission option another £124 13s 4d. A variation on the Series II was being made by the Japanese at this time, incorporating some features of the IIIA, under the Isuzu name. "All in all," concluded The Motor , "the 1960 Minx is the anticipated development of its predecessors in a long line of sensible family saloons. Family motoring on the 1 1/2-litre scale today implies performance which would have been considered sporting not very long ago; the latest in transmission design makes it possible to combine semi-sporting performance with very sophisticated effortless driving." Few changes were made in 1960, when the Minx was designated the Series IIIB. The front grille was in the same style as the IIIA, but made not from chrome, but anodised aluminium, which had the advantage of not being subject to rust. At the rear of the car, a hypoid axle replaced the spiral bevel type previously used. Easidrive continued to be an option. The Special was now renamed the Saloon Standard, and this was to be the last year of its production. 1961 saw the launch of the new Hillman Super Minx, which meant changes for the Series Minx. The new model, the Series IIIC, was essentially the same on the outside, but somewhat plainer in trim and appearance, more reminiscent of the 'Special' (later, 'Standard') - now discontinued - than the 'De Luxe'. It was distinguished from the IIIA and IIIB by a round profile Special/Husky style front bumper and the letters '1600' on the front doors in place of the 'Minx' script, which was moved to the rear of the boot. The '1600' indicated that the Series Minx now had the 1592cc Super Minx engine, although not as highly tuned. It was priced at £80 less than the Super Minx, with the emphasis on no-nonsense, value-for-money. In fact, there was quite a substantial reduction in the price of the saloon, even allowing for the fact that purchase tax in Britain had gone up. The saloon was down to £727 9s 6d, with tax (down from £764 14s 2d); the convertible £890 16s 5d; and the estate £873 6s 5d. The two-tone paint scheme now cost £14 3s 4d - because of the tax increase, and the Easidrive option £124 13s 4d - also increased because of tax. "Almost everything else which can be bought new at the same price of just over £700 is either slower or less roomy, if not inferior on both these counts. . . Although it is offered at a popular price, the model under review is quite nicely finished, and furnished in a far from austere fashion." The external chrome trim was simplified, and there were now no carpets in the rear of the car. A slight fascia redesign saw the speedometer move to the right hand side, nearest to the driver. A mileage trip recorder was added. "On the score of performance," said The Motor, 6th June, 1962, "there is remarkably little to choose between the Minx and the Super Minx, but there was a feeling amongst reviewers at the time that the Series Minx was becoming rather old-fashioned. "Its performance is up to date," said The Motor, "though its riding and handling qualities are not so modern." "If this car's design is not completely modern in every respect, the availability of a starting handle as an optional extra for only 7s 6d will make some motorists look at it in terms of 'the good old days'." Quite a few changes were made to the Husky for the second series in 1960. The output of the engine had been increased in November the previous year by the addition of inlet and exhaust manifolds from the Series IIIA Minx, and a new Zenith 30 VIG carburettor, but for 1960 major changes were made to the body, engine and gearbox. The front window was greatly increased in size, as it had been on the Series IIIA Minx, as was the window at the back, and the roof-line was lowered by 1 1/4 inches. Inside, the bucket front seats were set slightly further back to improve leg-room, and greater comfort was provided for passengers in the back. As before, the rear seats tipped forward to increase the luggage space to the proportions of a small van. Autocar magazine were surprised at the increased performance over the Series I: "It seems remarkable that such improvements as a reduction of 11.4 seconds in the time for acceleration from rest to 60 m.p.h. and an increase in 5 m.p.h. in maximum speed, should have been obtained while using the same basic power unit." The Series II Husky was available in five single tone and five duo tone colours, with a choice of red or fawn interior trim. A heater was an optional extra, at £17 5s [£17.25], as was a clock. "Affection for the Husky," concludes the Autocar review, "is formed within a very short mileage. Its responsive controls enable it to be driven in an enthusiastic manner . . . Intended for hard work, it is sturdily constructed, yet the need for rugged simplicity has in no way over-ridden the comfort requirements of the driver and his passengers." "Rootes have continued with the policy which began when the first Minx went into production in 1932, and can claim a longer uninterrupted run than any other current model. Year by year, the car has been kept up to date, and nothing is now left of the original, although continuity has never been broken." (The Motor, 4th September, 1963). It was lower and squarer than its immediate predecessor, the IIIC. The front grille was shallow and flat, with horizontal bars running across it, the front windscreen was flatter and squarer, the rear window no longer curved around the side of the car, and the fins were less pronounced. The size of the wheels was reduced from 15 inches to 13, and disc brakes were now fitted to the front, in addition to the Super Minx suspension. The same 1592cc engine as the Series IIIC was used, and an automatic option (for £90 extra) was available - not Smith's famous 'Easidrive', but the Borg Warner 35. In some export markets - principally North America - the Super Minx engine was fitted. Inside, the facia was completely redesigned, with two main dials directly in front of the driver. Separate front seats were now standard. As before, both single colour and duotone paint finishes were available. Single colour models had a single horizontal side moulding, two-colour models had a narrow double moulding, with the roof colour between them. The price of the Series V Minx was £634 18s 9d (about £634.95), including Purchase Tax of £109 18s 9d (about £109.95). Its maximum speed was 77.2 m.p.h. "Few Rootes Group dealers will argue with you if you call the Hillman Minx [Series] V an unadventurous car. But this humblest member of the Rootes 1.6 litre saloon car range sells well - and what's more, Minx buyers often stick to Minxes. "Among a motoring public that has recently become performance-car conscious, the Minx stands out as one of the few saloons that has made no compromises. It has soaked up detail improvements over the years, yet still offers a type of motoring that can be roughly classified as 'moderation in all things'." (Practical Motorist, April 1965). The final Minx, the Series VI, appeared in 1965. "Unbelievable as it may seem," said Autocar (31st December, 1965), "the Hillman Minx will soon be celebrating its 35th birthday, and during its lifetime it must have provided family transport for literally millions. During the war, under its khaki paint, it did service as a staff car. Today there are two versions of the Minx - the Super and the "standard", now called the Series VI." Changes from the Series V included a 1725cc engine and a new facia, very similar to that of the Imp, with a long, horizontal speedometer, and water temperature and fuel gauges at either end. "Inside," according to Autocar, "the Minx VI has been redesigned by someone who really knows what a driver wants." The 1725cc engine was basically the same as the 1592cc, but with five main bearings for the crankshaft. At first, the engine was intended to have 65 b.h.p., but in the end this was reduced to 58.5, for reasons of fuel economy. Top speed was nevertheless increased to 82 m.p.h., according to Autocar, most of whose test mileage was done during the coverage of the RAC Rally! In top gear, they said "it does no harm to let it run up into the 90s on down grades for brief spells (when travelling abroad!)." When it first appeared, it was £20 more expensive than the Series V had been, but including Purchase Tax of £115 2s 1d (about £115.10), the total price came out at £660 2s 1d (about £660.10). The heater, though, was still an extra at £18 2s 6d (about £18.12), as was a radio at £28 3s 8d (about £28.18). "Like an old house which has been modernized, the Husky III retains a good deal of the original planning." (Autocar, 27th December, 1963). The Series III Husky came out at the same time as the Series V Minx, and had the same redesigned front end and grille. Otherwise, it remained the same as the Series II on the outside: unlike the Series V Minx, drum brakes were fitted to all four wheels, which were still the 15 inch diameter type. It retained its 1390cc engine, although the 1592cc Minx engine was fitted for North America. Improved fuel consumption was obtained by fitting a new Zenith 30 VNN carburettor. Autocar's special test track "was covered with almost exceptional (and unexpected) ease for such a low-priced utility." The price was, in fact, £586 12s 1d (about £586.60), including £101 12s 1d (about £101.60), which made the Husky about £48 cheaper than the Series V Minx. Inside, the facia was like the Series V Minx, but with slightly simpler equipment.